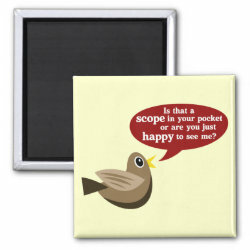 Home > Funny Birder Gifts	> Scope In Your Pocket? 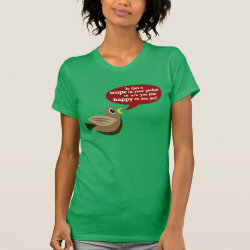 If birds had pickup lines for breathless birders, this would be a classic. 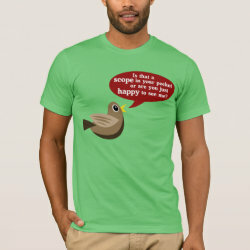 A small cartoon bird asks "Is that a scope in your pocket More... or are you just happy to see me?" It would have to be a pretty big pocket, but I guess in the case of certain birds, the answer would almost certainly be YES.